Did you know that sheep are waterproof? A compound in their fleece called lanolin repels water and helps to keep them toasty warm in the coldest weeks of winter. If lanolin seems familiar, you might have seen it in your hand cream - it's great for dry skin. Sheep form a large part of Australia's thriving agricultural industry. Australian farmers produce excellent wool and some of the best quality lamb in the world. 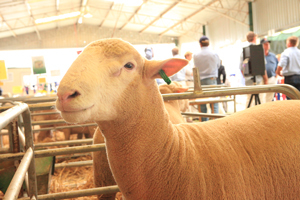 You can meet fleece, meat and dual purpose sheep at the ActewAGL Royal Canberra Show - stop by and say hello! The Sheep Pavilion (Map Ref J5) opens from 9.00am to 8.00pm on Friday and Saturday and from 9.00am to 5.00pm on Sunday. Membership: Financial members may claim 20% reduction on total entry fees where total of entry fees are $30 or more, or as outlined in the Conditions of Entry.